The Ohio Veterans Home in Sandusky4 supplied additional information about Thomas. When he was admitted to the home on December 19, 1920, Thomas was single giving his niece, Mrs. Mary Cox5, of Bloomington, Illinois, as his next of kin. 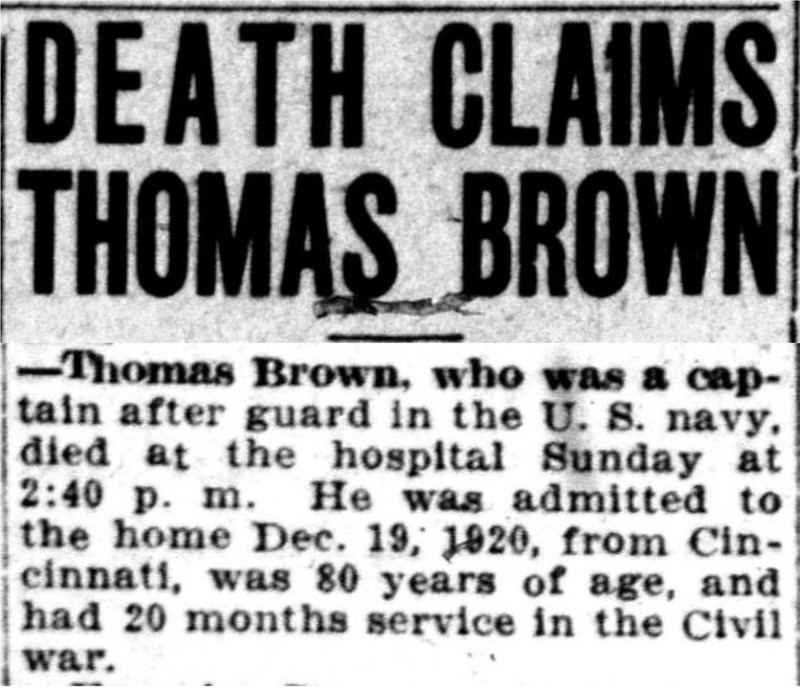 Thomas was admitted to the Home from Cincinnati, Ohio for “general disability” but was transferred to the hospital section of the home on March 21, 1924, two years before his death. His date of birth was given as May 3, 1846, (different than that shown on the death certificate), and he had lived in Ohio for twenty-two years. Although Thomas gave his occupation as a farmer, he did not own property and had no living family. Records at the home (and in the death notice in the local newspaper – see footnotes6) identify several pieces of conflicting information including the year and place of his birth and his residence over the years. In varying records, Thomas gave his year of birth as anywhere between 1845 and 1849. In some records he stated that he was born in Boston while in other records he was born in Ireland. We know from baptismal records in County Limerick, that Thomas was baptized May 6, 1847 at Patrickswell RC Church7 confirming his year of birth as 1847 in Ireland. (See copy below). Other conflicts will be addressed throughout the blog post. The records at the Home also included information about Thomas’ military service. He enlisted in the Navy at Cincinnati on December 1, 1846 during the Civil War and was discharged February 2, 1865 in Cicero, Illinois (more conflicting information) as a “Captain in the Navy After Guard”8 when his enlistment term expired. He received $50.00 a month from his government pension listed under number 1163678. 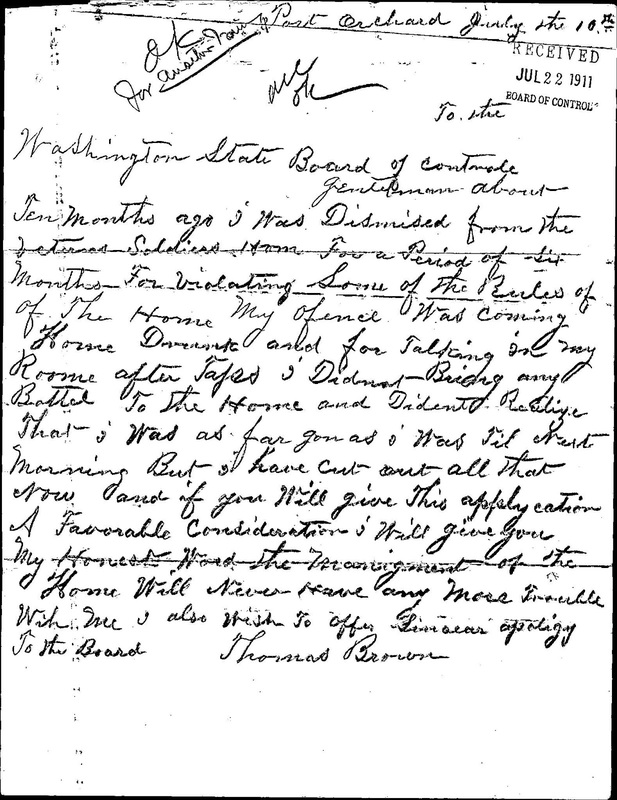 Using the pension number, I requested Thomas’ pension record from the National Archives in Washington, D.C. It could not be located at NARA and they suggested that I contact the Veterans Administration – which I did. It could not be located there either. I have made many attempts to locate this record, but it remains “lost.” However disappointing that is, there are a couple of records associated with Thomas’ service that are available – an Enlistment Record and a Service Card – which provide clues to his life. The Enlistment Record9 (see copy below) shows that Thomas did indeed enlist in the U.S. Navy at Cincinnati, Ohio on January 28, 1864. Thomas, described as 5 feet 7 inches tall with fair complexion, grey eyes and dark brown hair, gave his occupation as tobacconist, (remember his older brother, James, was also associated with the tobacco business), and he listed his current residence as Illinois. He also stated that he was born in Ireland and that he was 18 years old. Since Thomas was baptized in 1847 (see Baptismal record above), he was actually 16 years old at the time of his enlistment. This provides a plausible explanation of why he enlisted in Cincinnati rather than Chicago where he had been living with his mother and other family members. Like many other young men who wanted to participate in the war, he likely ran away from home and lied about his age! I would guess that his mother, Hannah, strongly objected to his underage enlistment. Remember that Chicago was a railroad hub and there were trains going everywhere. It would have been very easy to hop a train - Cincinnati was only a few hours away. After the Civil War, Thomas returned to Chicago from 1867 to at least 187112 where he is shown in the Chicago Directories with the family. After that, it was difficult to locate his whereabouts; so, I turned once again to the narrative of David Brown13. (See clip of the David Brown letter below.) David must have seen Thomas’ service and pension records since he identified various places that Thomas lived. However, the next record that I could positively identify was information from a Veterans home in Washington State14. The state of Washington maintains four homes for veterans. Over a twelve year period, from 1903 to 1915, Thomas resided in two of them – Washington Soldiers’ Home and Colony and the Washington Veterans Home. 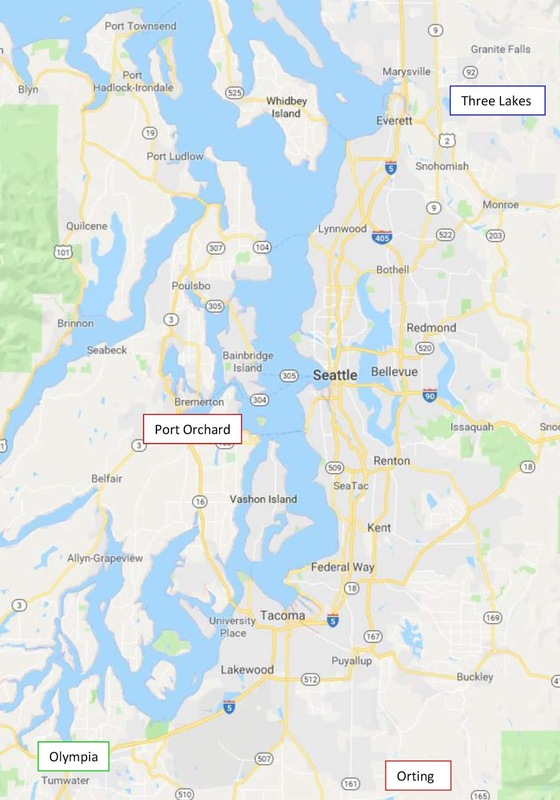 the City of Orting but would be serviced by the Soldier’s Home. Certain restrictions applied and the entire family needed to comply with all of the rules and regulations of the Home. In 1892 there were 37 residents; by 1895 there were 99 residents; in 1897 there were 110 residents and by 1907 there were 385 men residing in a community planned for less than half that number. Clearly an additional facility was needed15. 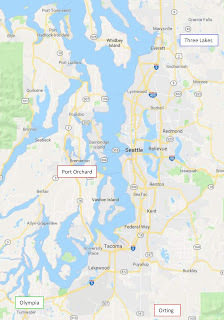 In order to deal with the overcrowding and lack of provision for families, a second home, the Washington Veterans Home, was built near Port Orchard (Retsil) at Annapolis on Sinclair Inlet overlooking Puget Sound. Besides the ease of access and proximity to large populations, and clean water, this site had the added advantage of “magnificent scenic views of mountains and water.” The first two structures were cottages designed to accommodate eight couples each. 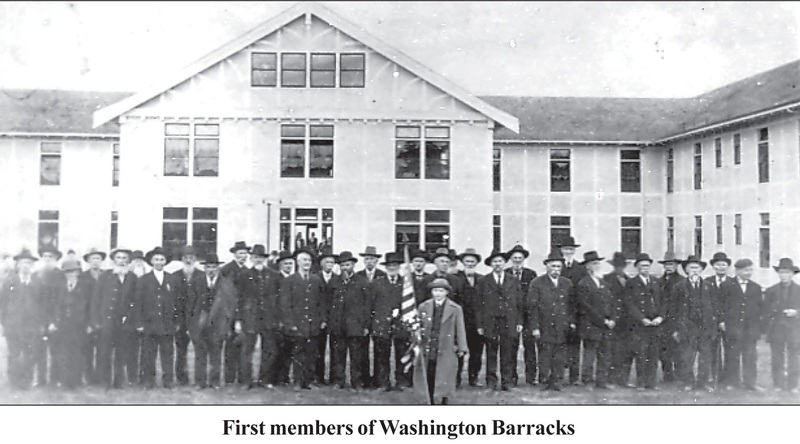 The next building completed was the “Washington Barracks” designed to house single men. More cottages and barracks were soon added. The Home was dedicated February 22, 1910. At the end of the first day, 127 men and women were registered as residents; that number grew to 187 by the end of the year16. was given on the document), Thomas was asked to leave the home for infringement of house rules18. (See copy of document left). He gave his future address as Camp Douglas, Utah (known as Fort Douglas). Fort Douglas is located near Salt Lake City where George Roach, a son of Thomas’ sister, Johanna Brown Roach, was living with his family. (See previous blog post Children of Johanna and Thomas.) Even though Thomas did not list living relatives in his application to the home, this does infer that he chose Utah because he knew George Roach was living there. He certainly would have known George from his years in Chicago; however, there is no further indication that Thomas actually went to Utah. 1845 making him just sixty-two. The application included a letter of apology for his misconduct where he promised to abide by the rules in the future. Thomas was readmitted with a $12.00 pension on January 1, 190819. Thomas bounced between the two homes in 1914 and again in 1915 not being able to "settle," and trying to find help for his alcohol addiction21. He appears to have left the state in 1916. 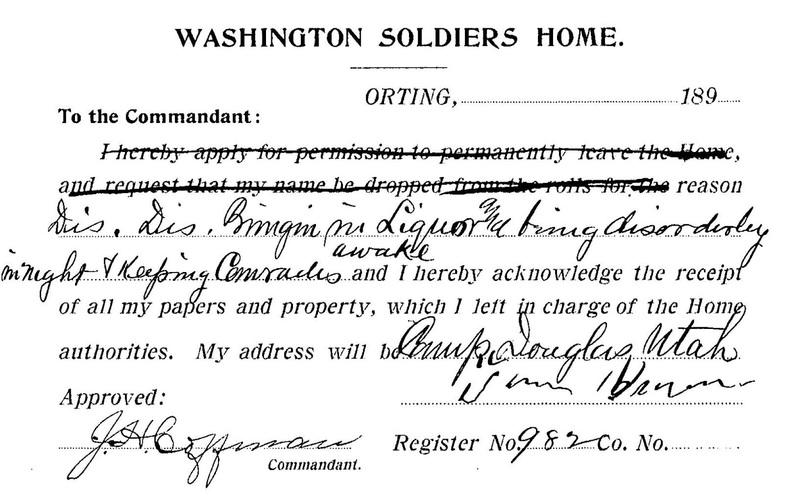 We will follow him to his next destination; however, there is documentation in his initial application to the Washington Soldiers Home (Orting) that gives access to details of Tom’s life after his discharge from the Navy in 1865. That is where we will go with the next blog post. Court View South, Historic American Buildings Survey, Creator. Ohio Soldiers' & Sailors' Home, U.S. Route 250 at DeWitt Avenue, Sandusky, Erie County, OH . Erie County Ohio Sandusky, 1933. Documentation Compiled After. Photograph. https://www.loc.gov/item/oh1745/. 3. 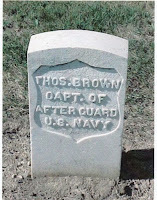 Tombstone of Thomas Brown, Ohio Veterans Home Cemetery, Section E, Row 1, Marker 35. 4. Personal email received February 19, 2008 from Ronald J. Beverick, MBA, Chief Information Officer, Ohio Veterans Home Agency. 5. Mary Ann Cox is the oldest daughter of Patrick Brown and Ann Burns – Patrick being Thomas’ oldest brother. She married James Cox in Illinois on January 13, 1881. See blog post ". . . and he leaves a large family to mourn his death." Not all information in the David Brown letter (see copy in text of the blog post) agrees with information that was uncovered while researching Thomas. David Brown says that Thomas gave the name of a nephew, Patrick, from Cleveland, as his next of kin while residing at the Ohio Veterans Home. That conflicts with information from the Home. I have not found a Patrick Brown in Cleveland. As we saw in the last blog post on Thomas’ older brother, James (" . . . to Cleveland"), the only immediate family members found living in Cleveland in 1920, were George and Raymond Brown, sons of James. 6. The death notice for Thomas (see below) was found in a regular column about the Old Soldiers and Sailors Home (O.S. & S.) in The Register, Sandusky, Ohio, under news about neighboring communities. The column contains information concerning what was happening at the home – about the inmates and their activities, the staff, and who was visiting. The column appears to be quite “chatty,” and, hopefully, indicates a pleasant atmosphere. 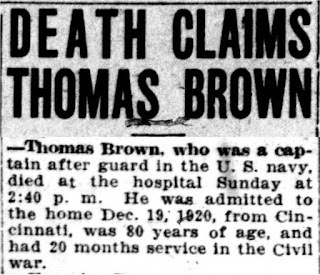 “DEATH CLAIMS THOMAS BROWN,” The Register, Sandusky, Ohio, February 23, 1926, page 9 and February 24, 1926, page 9. 7. Thomas Browne, Baptism, Lurriga: County of Limerick; Diocese of Limerick, Baptisms, March 1847 to Dec. 1847. National Library of Ireland, microfilm 02409/06, page 13. Lurriga is also known as Patrickswell. The record is very difficult to read. The record is on line 637 for May 7, 1847 and reads, Thomas son of Thady Browne and Hannah Kelly. Sponsors were Thomas Browne and Johanna Looney. 8. The ranking of “Captain of the After Guard” is generally associated with sailing ships and was the leader of a group of sailors responsible for raising and lowering the aft sail. Thomas served only on steamships, so it is difficult to understand the duties of Thomas on the steamship. Other records show that he was an “ordinary seaman.” Remember that Thomas was quite young when he was in the Navy during the Civil War. 11. All four ships listed on Thomas’ Service Card were side-wheel steamships that worked the Ohio and Mississippi Rivers. Although the Clara Dolsen supported the recapture of Henderson, Kentucky in July 1862, of the four, only the Avenger saw enemy action on the Red River in April and May, 1864. The Great Western was used to supply ammunition to various combat units. She supported the Vicksburg campaign (1862-1863) in this capacity, but, this was before the dates that Thomas was in the Navy. In July, 1864, she was sent to Cairo, Illinois to act as a receiving ship. The Avenger and the Great Western were roughly the same size at around 200 feet long and 400 tons. The Clara Dolsen was by far the largest ship at nearly 270 feet long and 940 tons. The Grampus was the smallest at 180 feet long and 230 tons. Information on all four ships was retrieved using Wikipedia. 13. Brown, David, Kewanee, IL., 11 May 1943. Letter to Esther _______, Columbus, OH, page 9 and 10. 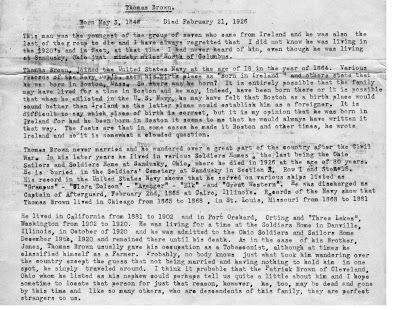 Information in the letter has been used to further research the Brown family. 15. A Comprehensive History of the Washington Soldiers’ Home and Colony 1891-1991; compiled in 1971 by Mrs. Murial Furney; edited in 1991 by Miriam Young and Donna Bogumill; Washington Veterans Home print shop. Available online at: https://www.dva.wa.gov/sites/default/files/Orting%20History.pdf. 16. Washington Veterans Home 1910-1980, 70th Anniversary Historical Summary; edited and published by Donna Bogumill, 1980; Revised Edition 2005. Available online at: https://www.dva.wa.gov/sites/default/files/History%20Retsil_0.pdf. 17. Records for the Washington Soldiers’ Home and Colony and the Washington Veterans Home for the years 1903 to 1916 were obtained online from the Washington State Archives at https://digitalarchives.wa.gov/ in the “Military Category.” Six folders are associated with Thomas’ tenure at the Washington Veteran Homes – numbers 43, 192, 525, 743, 982, and 2607. 19. 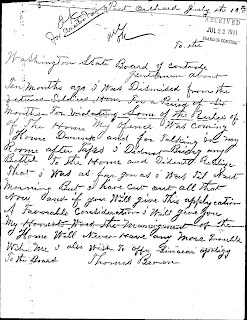 Folder 982 containing two applications for admission to the home and various other documents, Veterans Affairs, Department of, Orting Soldiers Home, Member Files, 1891-1987, Washington State Archives, Digital Archives, http://digitalarchives.wa.gov, accessed 28 March 2019. 20. Folder 192 containing various documents, Veterans Affairs, Department of, Retsil Veterans Home, Member Files, 1910-1977, Washington State Archives, Digital Archives, http://digitalarchives.wa.gov, accessed 28 March 2019. 21. Op. cit. Folders 2607 from Orting and 743 from Retsil containing various documents. worked in the tobacco industry and lived with or near relatives. On March 21, 1875, James and Louise Primrose were married by Rev. Horatio N. Powers of St John’s Episcopal Church on Ashland Ave in Chicago1. (See copy of marriage record left) Their son, Milton, was born in 1875 and on August 23, 1878, a daughter, Sophia, was born2. Spaulding & Merrick Tobacco Works, James was served a summons to appear in court on the first Monday of March4 in a divorce petition brought by Louise. 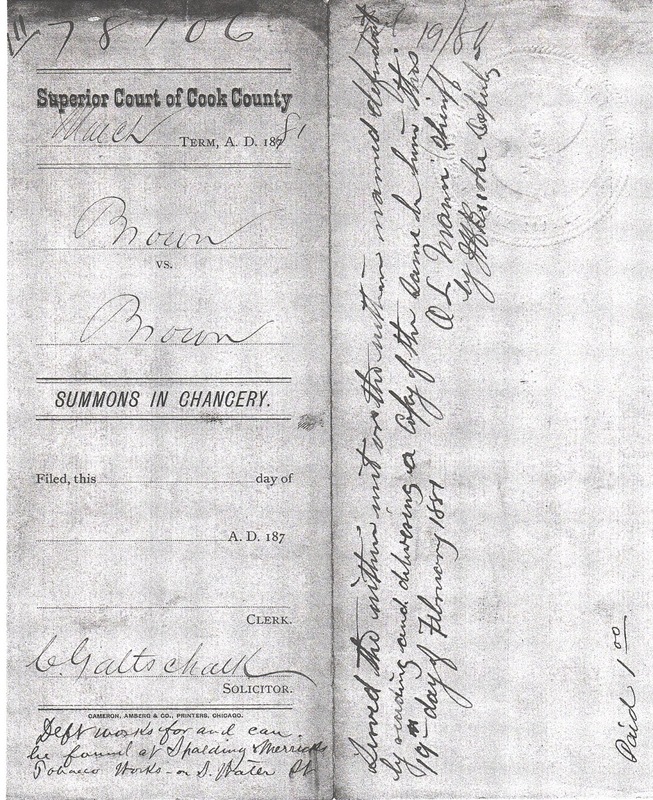 (See copy of Summons left) In March 1881, just six years after they were married, Louise was granted a “Decree for Divorce on Default5.” James may have actually left Chicago before the divorce was final which is why he was not at the trial. McDowell and Margaret Dingman. She was born March 18, 1860 in Brooklyn, New York7. Frances had three siblings; Mary Jane, Emma, and John Henry. 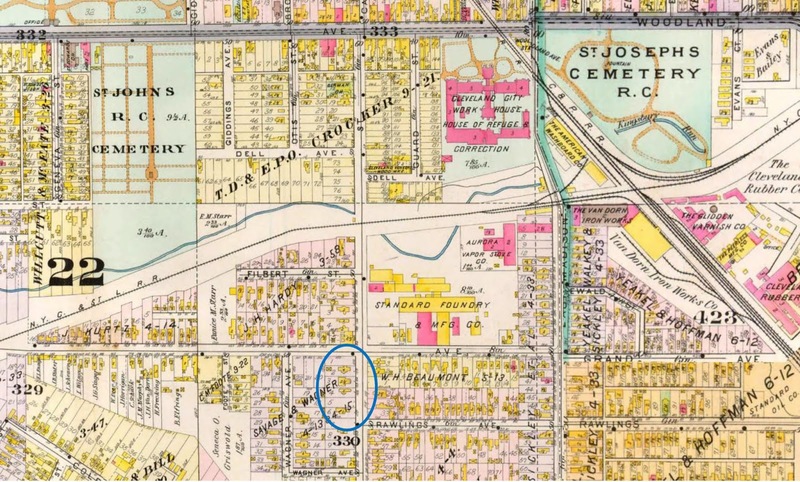 The 1880 US Census for Cleveland shows Fannie, Emma, and John living with their widowed mother, Margaret McDowell on the Filbert extension8 on the east side of Cleveland. The women in this family were listed as seamstresses. John was listed as a “cigar maker” suggesting that Fannie may have met her future husband through her brother. 1883; George A., born May 28, 1886; Florence D., born November 12, 1888; and Raymond, born January 22, 18929. On August 6, 1885, James purchased a house for $1,400 from Charles and Frances Miller located on Herald Street in Cleveland10. (See map of Cleveland) James was to live in this home until his death from vascular heart disease on May 27, 1899, at age 5411. In January 1894 Fannie filed for a divorce from James. The divorce was finalized on June 22, 1895 citing extreme cruelty12. Just as with the Chicago divorce, we learn additional details of James’ life. Although the name of his employer is not identified in the file, James earned $15 a week working as a tobacco dresser/cutter; and, although I could not identify a specific property, information in the file indicates there was also an additional rental property, and loans made to several individuals, suggesting, perhaps, at least, some affluence. Fannie was granted alimony of $5 a week to a total of $600 to pay expenses for herself and the children. James took out a mortgage on the Herald Street property on June 19, 1895 to pay the amount of alimony in full13. Fannie was married two more times – to George Ratcliff on September 15, 1896 in Cuyahoga County14, and, to Orin Vaughn on May 15, 1912 in Portage County, Ohio15. Both marriages ended in divorce16. M. Brown and Milton Brown whose last known address was 2429 Wabash Avenue, Chicago, Illinois. Given the dates, this hardly would have been time for Milton to travel to Cleveland even if he had received advance notice of the sale. This is the last known reference, or any documented evidence, of the eldest son of James Brown. Of the other four children, two died young. James’ son, George, died March 26, 1926 in Cleveland of heart disease leaving a wife and one year old daughter. Raymond never married and died in the Cleveland area on April 15, 1936 of cancer. Florence married Richard Cullen in New York. They had one daughter. Florence died in 1966. Jennie Francis married John Richards in 1903, and died in Elyria, Ohio in 1949. Jennie and John had three children. Find-a-Grave21 indicated Civil War Service for James with the 150th Ohio Voluntary Infantry. I thought, perhaps, James had kept in contact with someone from his service unit and this was the reason James moved to Cleveland. However, when I searched various records for this person, I found the information was attached to the wrong soldier. 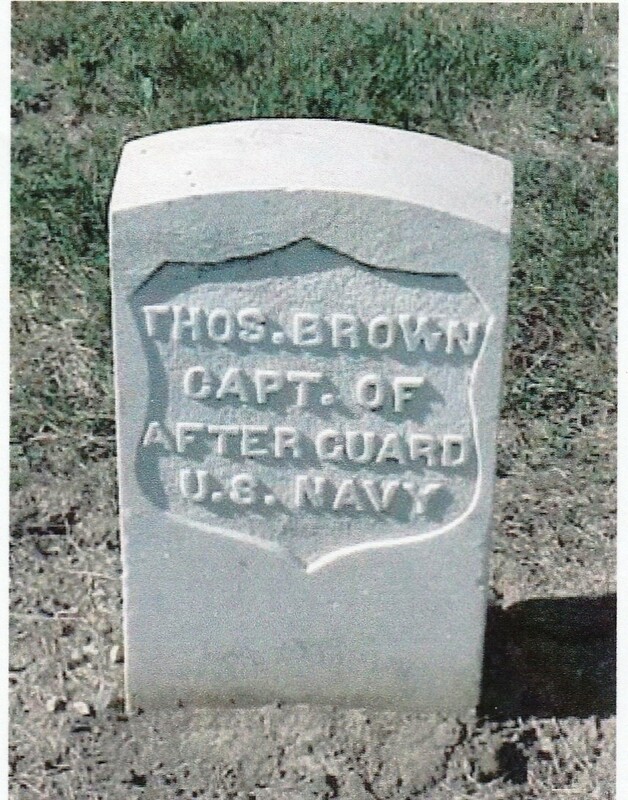 (See footnotes22) Indeed, I found no documented evidence that James served during the Civil War even though there is one Navy record where a “James Brown” was serving on the same ship, (The Great Western), as his younger brother, Thomas Brown. (See footnotes23) Because military records from that era are, in general, so complete, I was hoping to find a file that contained a physical description for James. The only description for James was found in the record from his first divorce in Chicago, where Mr. Gottschalk, solicitor for James’ first wife, Louise Primrose, made a derogatory statement that James had “red hair” indicating some sort of quick temper. I do intend to follow-up on possible military records for James; however, it is time to look to the youngest of the original immigrants, Thomas Brown, who will be the subject of the next blog. 1. 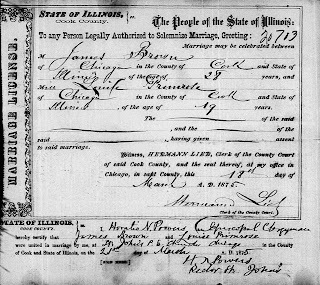 "Illinois, Cook County Marriages, 1871-1920," database, FamilySearch(https://familysearch.org/ark:/61903/1:1:N76M-187 : 10 March 2018), James Brown and Louise Primrose, 21 Mar 1875; citing Chicago, Cook, Illinois, , Cook County Courthouse, Chicago; FHL microfilm 1,030,091. The marriage record shows James as 28 and Louise as 19. James’ calculated age would be a little older, nearer age 30. Information about minister, Horatio Powers, from page 60 of the 1874-5 Lakeside Annual Directory, Chicago, Illinois. 2. 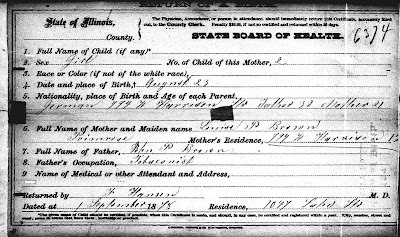 Illinois, Cook County, Birth Certificates, 1871-1940 https://www.familysearch.org/ark:/61903/1:1:NQTF-S24. Note the birth certificate shows the name of the father as John F Brown; however, the mother’s name, Louise Primrose, the father’s occupation, tobacconist, and place of residence is the correct information for this family. The date of birth for Milton is derived from information contained in the divorce records for James and Louise – see previous blog. 3. 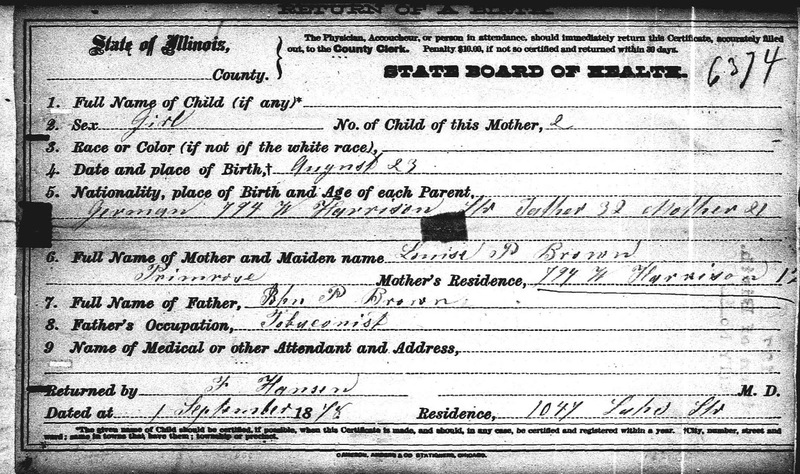 Year: 1880; Census Place: Chicago, Cook, Illinois; Roll: 192; Page: 264A; Enumeration District: 094. 6. 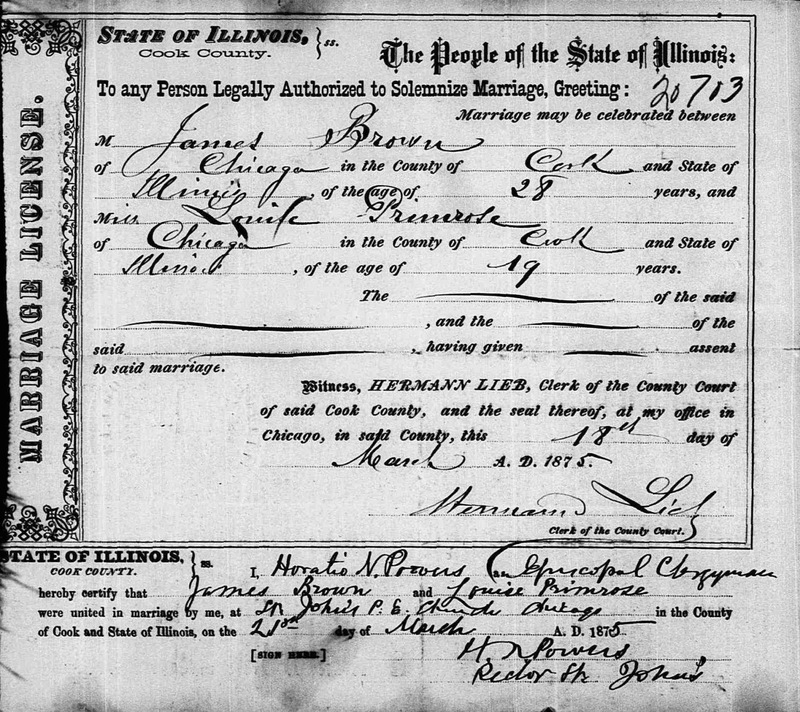 "Ohio, County Marriages, 1789-2013," database with images, FamilySearch(https://familysearch.org/ark:/61903/1:1:XZXD-HL9 : 8 December 2017), James F. Brown and Fannie Mcdowell, 07 Dec 1881; citing Cuyahoga, Ohio, United States, reference v 24 p 503; county courthouses, Ohio; FHL microfilm 877,921. 7. 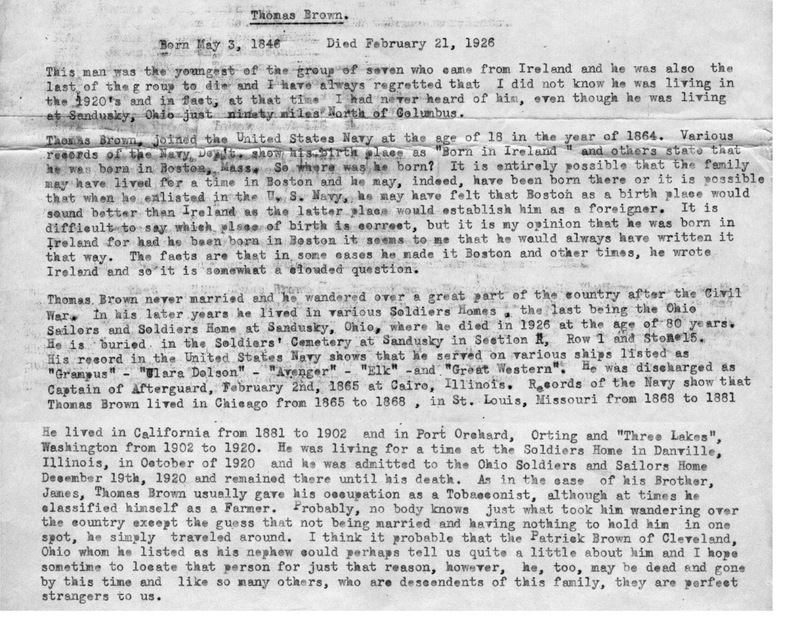 "Ohio Deaths, 1908-1953," database with images, FamilySearch(https://familysearch.org/ark:/61903/1:1:X6BB-4M1 : 9 March 2018), Frances Brown, 16 Jan 1947; citing , reference certificate; FHL microfilm 2,372,967. 8. "United States Census, 1880," database with images, FamilySearch(https://familysearch.org/ark:/61903/1:1:M8M9-F27 : 13 September 2017), John Mc Dowell in household of Margrett Mc Dowell, Cleveland, Cuyahoga, Ohio, United States; citing enumeration district ED 46, sheet 106C, NARA microfilm publication T9 (Washington D.C.: National Archives and Records Administration, n.d.), roll 1008; FHL microfilm 1,255,008. 9. 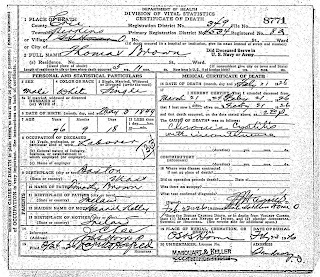 "Ohio Births and Christenings, 1821-1962," database, FamilySearch(https://familysearch.org/ark:/61903/1:1:X636-DX8 : 11 February 2018), Fannie Brown, 19 Jun 1883; citing Cleveland, Cuyahoga, Ohio, reference v 5 p 317; FHL microfilm 877,903. "Ohio Births and Christenings, 1821-1962," database, FamilySearch(https://familysearch.org/ark:/61903/1:1:X6PK-7RP : 11 February 2018), Geo. A. Brown, 28 May 1886; citing Cleveland, Cuyahoga, Ohio, reference p156; FHL microfilm 877,904. "Ohio Births and Christenings, 1821-1962," database, FamilySearch(https://familysearch.org/ark:/61903/1:1:X6PC-RXJ : 11 February 2018), Florence D. Brown, 12 Nov 1888; citing Cleveland, Cuyahoga, Ohio, reference p88; FHL microfilm 877,904. "Ohio Births and Christenings, 1821-1962," database, FamilySearch(https://familysearch.org/ark:/61903/1:1:X639-3HK : 11 February 2018), Brown, 22 Jan 1892; citing Cleveland, Cuyahoga, Ohio, reference p 97; FHL microfilm 1,986,515. 10. Cuyahoga Co., OH, Deed Book 388, pages 88 and 89. 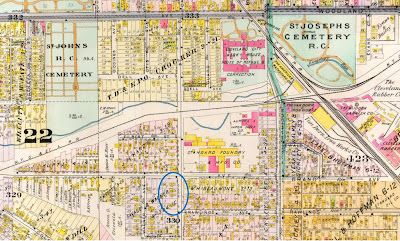 Charles G. and Frances A. Miller to James Brown sub lot four in Savage and Wagners allotment of a part of original lot No. 330 Newburgh Township on Maple Grove Street. The street name (and house number) was changed several times. The street was also called Grove Street, Herald Street when the property was purchased, and is now known as East 75th Street. No buildings exist on this property today. 11. "Ohio, County Death Records, 1840-2001," database with images, FamilySearch(https://familysearch.org/ark:/61903/1:1:F62D-65S : 11 March 2018), James F. Brown, 27 May 1899; citing Death, Cleveland, Cuyahoga, Ohio, United States, source ID cn 43470, County courthouses, Ohio; FHL microfilm 879,247. "Ohio, County Death Records, 1840-2001," database with images, FamilySearch(https://familysearch.org/ark:/61903/1:1:F62B-18K : 9 March 2018), James F. Brown, 27 May 1899; citing Death, Cleveland, Cuyahoga, Ohio, United States, source ID p 458, County courthouses, Ohio; FHL microfilm 1,977,438. 12. Cuyahoga County, Ohio, Common Pleas Court, Divorce Case 48626 (1894), Frances Brown v. James Brown. Various documents. Divorce finalized 22 Jun 1895. 13. Cuyahoga Co., OH, Deed Book 606, page 158. Frances Brown deeds property on Herald Street to James Brown for $600. 14. "Ohio, County Marriages, 1789-2013," database with images, FamilySearch(https://familysearch.org/ark:/61903/1:1:X85P-7MK : 10 February 2018), George Ratcliff and Fannie Brown, 15 Sep 1896; citing Cuyahoga, Ohio, United States, reference cn12410; county courthouses, Ohio; FHL microfilm 877,931. 15. "Ohio, County Marriages, 1789-2013," database with images, FamilySearch(https://familysearch.org/ark:/61903/1:1:X8JC-XCF : 10 February 2018), Orin M. Vaughn and Frances J. Brown, 15 May 1912; citing Portage, Ohio, United States, reference 387; county courthouses, Ohio; FHL microfilm 891,366. 16. Cuyahoga Co., OH, Common Pleas Court, Divorce Case 88718 (1904), Frances Ratcliff v. George Ratcliff. Final Decree. Divorce finalized 22 Oct 1908. Cuyahoga Co., OH, Common Pleas Court, Divorce Case 155634, Frances Vaughn v. Orin Vaughn. Final Decree. Divorce finalized 22 DEC 1917. 17. Records for settling the estate, appointment of guardianship and sale of property were found in various documents in multiple files in the Cuyahoga County Court system. See case files 17542, 20968, 20972, and 61946. No exact inventory was found in any of the files. 18. "Ohio Deaths, 1908-1953," database with images, FamilySearch(https://familysearch.org/ark:/61903/1:1:X67F-DQM : 8 March 2018), Mary Jane Woltman, 04 Sep 1934; citing Cleve Hts, Cuyahoga, Ohio, reference fn 53226; FHL microfilm 1,993,041. 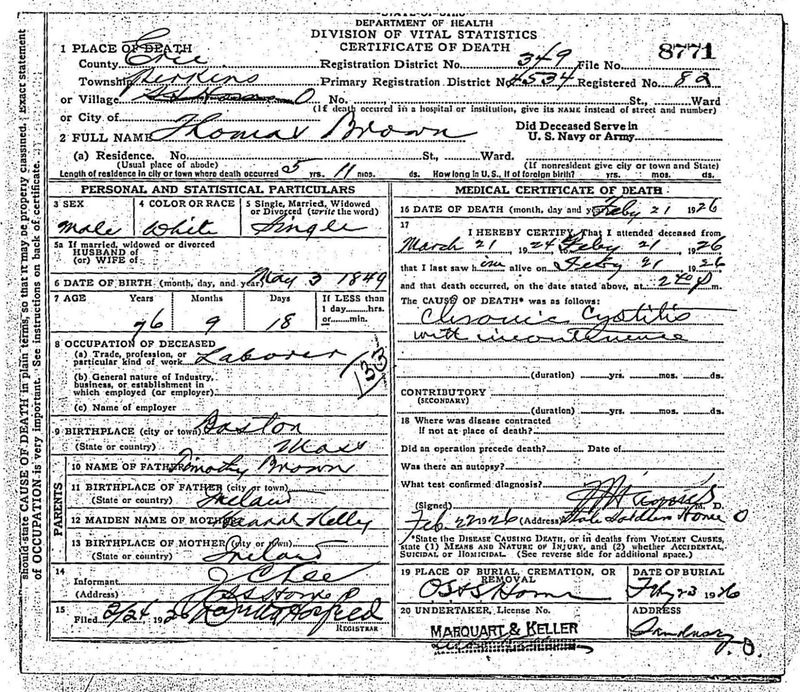 The death certificate for Mary Jane Woltman, who died September 4, 1935 shows the names of her parents as George McDowell and Margaret Dingman identifying her as a sister of Frances McDowell Brown. The death certificate also gives the name of her husband as William Woltman, the person named as guardian for the minor children of James F. Brown. 19. 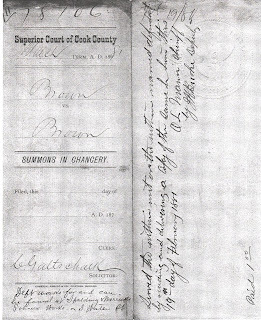 The letter from the attorney of Joseph M Brown, C A Judson (see image above), identifies him as being the son of James F. Brown by his first marriage. The letter was found in the Guardianship case, 20972, in the Cuyahoga County court system. The letter has a “received” date stamped July 31, 1900. 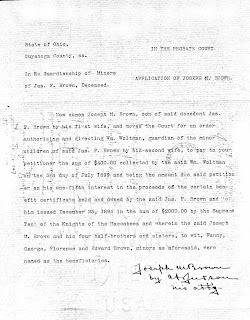 The guardianship papers were dated May 29, 1899, more than a year prior to the application of Joseph M Brown being received; yet, the guardianship papers specifically state that the four children of James F. and Fannie Brown had a one fifth interest in the estate. 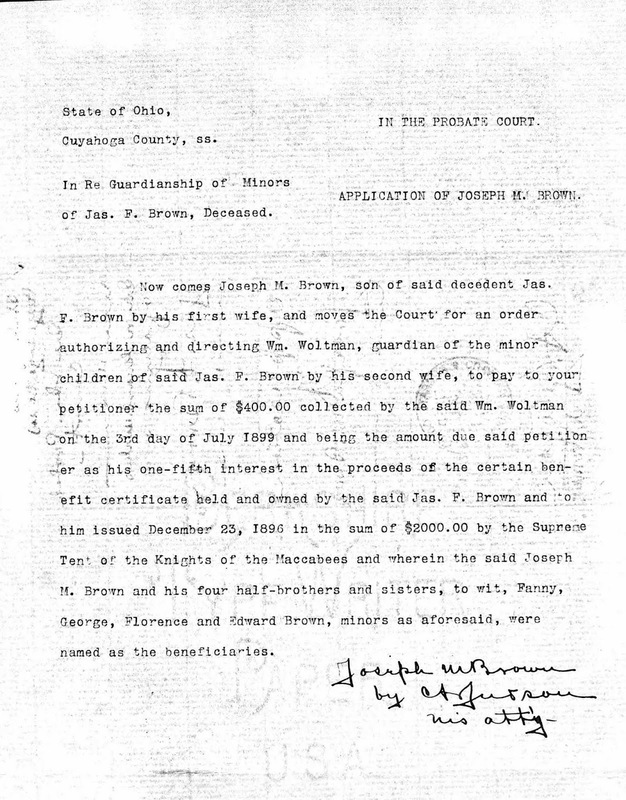 Assuming the Cleveland family knew of the existence of a son from a previous marriage, did they attempt to contact Joseph M. Brown when James died? Calvin A Judson is listed as an attorney practicing in Cuyahoga County in the 1899 version of the city directory for Cleveland. This raises a question of whether Joseph M. Brown traveled to Cleveland to pursue his portion of his father’s estate or if he corresponded with the attorney to further his case. There is no specific information in any of the case files for James F. Brown to indicate whether or not Joseph M Brown received his share of the estate. 20. 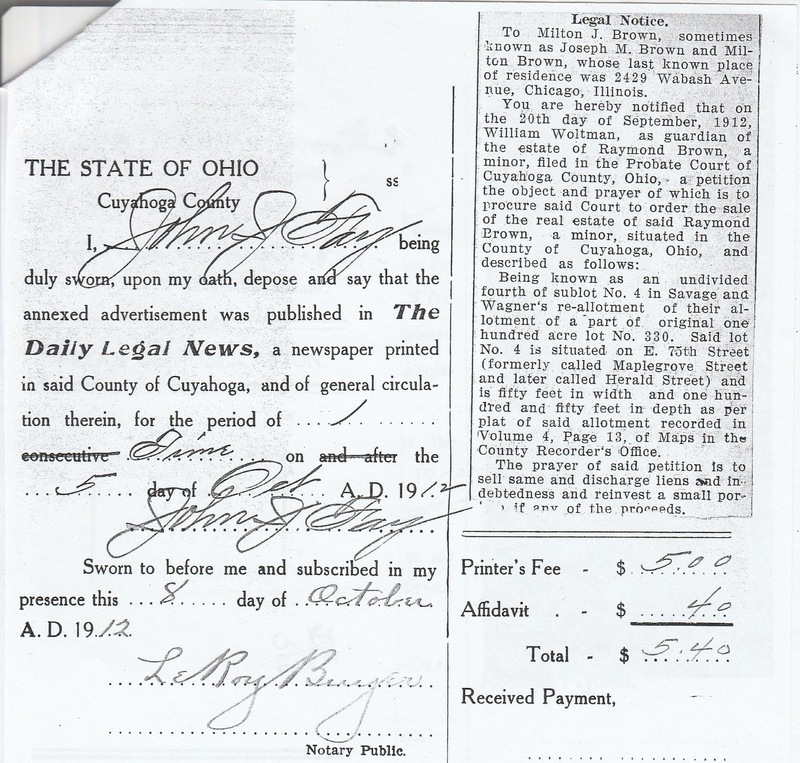 The “Legal Notice” (see image above) published in the October 5th and 8th 1912 issues of The Daily Legal News was found in file 61946, Petition to Sell Real Estate folder. There is also a “Precipe” [receipt] for mailing a copy of the notice to Joseph Milton/Milton Joseph at his last known address dated October 5, 1912. There is no indication of a reply from Joseph Milton/Milton Joseph Brown. As indicated in the previous blog, (link to blog) Joseph Milton/Milton Joseph Brown was not found in Chicago after 1904. The property was sold to Louis and Terez Bertok on October 18, 1912 for $650. Cuyahoga Co., OH, Deed Book, Volume 1423, Page 432. 21. Find-a-Grave Memorial ID16329041 https://www.findagrave.com/memorial/16329041/james-f.-brown. 22. 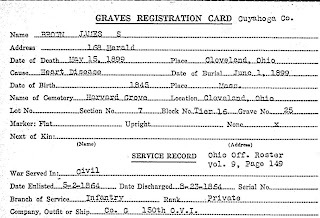 The source of the Find-a-Grave notation of James’ Civil War service came from the Ohio, Soldiers Grave Registration Cards. The database was created by the Ohio History Connection (Ohio Historical Society) in Columbus, Ohio and can be found at Ancestry and Fold3. The card (see below) shows the correct burial information (except for the middle initial), but the “Service Record” at the bottom of the card is incorrect. Reviewing the reference for the roster of soldiers shown on the card, only one man by the name of James Brown served in Company G of the 150th Ohio Volunteer Infantry. Cards identifying soldiers with Civil War pensions are also available at Fold3. 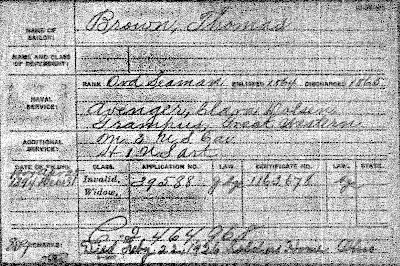 Using that information, I found that the James Brown serving in Company G of the Ohio 150th Infantry shows application and certificate numbers “1135567” and “1005263.” There is also a file for a widow – “723531” and “504425.” This raised several questions about the pension for the soldier and which wife received the subsequent benefits. On a recent trip to the National Archives in Washington, D.C., I had an opportunity to review this pension file. This pension belongs to James A. Brown who died in July 1900 in Canton, Stark County, Ohio. 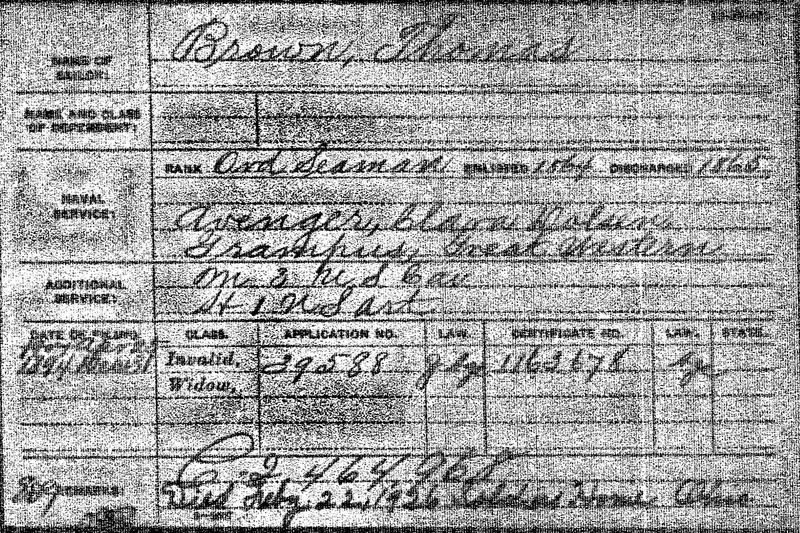 Reference to his Civil War military unit is shown on the back of the “Health Department Return of a Death” record issued in Stark County, Ohio at the time of his death. This James was married only once to Ellen Herrick - the widow who received the benefits for James A. after his death. This obviously is not our James F. Brown. 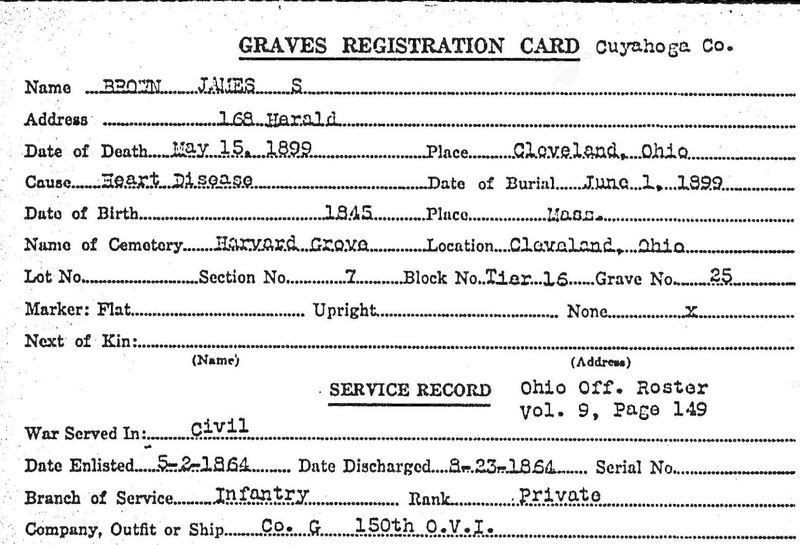 There is also a Grave Registration Card for James A. Brown showing all of the correct information. I am attempting to have the records corrected, but, this may take awhile to complete. 23. While reviewing pension records for “James Brown,” I ran across a record for a James Brown who served on the “Great Western.” This coincidentally is the same ship where James’ younger brother, Thomas Brown, served during the Civil War. (We will see more information about Thomas and his service in the next blog.) The card is available on Ancestry in the Civil War Pension Index database. An application number is also given on this card which proved to be a number for a “disapproved” pension. (This information is also available on Ancestry in the U.S. Navy Pensions Index, 1861-1910.) While at the National Archives, I looked at this pension information which proved to consist of one document identifying that there was a file started. 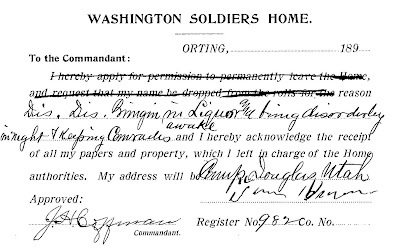 (This database is also available on Fold3 in the database for Civil War – Navy Suvivors’ Originals [Disapproved].) One of the staff members at the Archive pointed out that the card referenced a unit for the U.S. C. Inf. – US Colored Infantry – and suggested this was not the person I was trying to find. The Archives was getting ready to close and I was not able to return the next day so I abandoned my search at that time. I am still intrigued by this reference and intend to try to find other information about this soldier including enlistment records and where he was originally located.